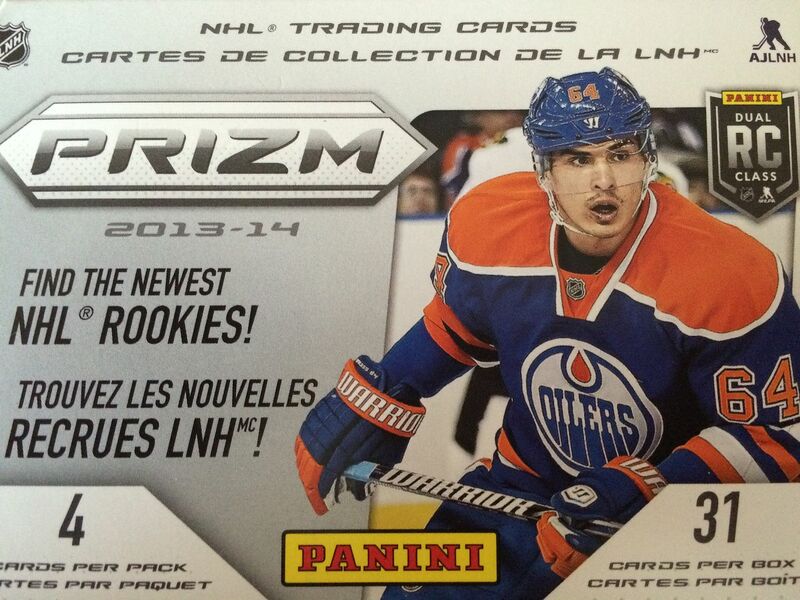 Today I'm going to check out a blaster of 13/14 Panini Prizm. It's a product that Panini really pushed a few years ago but has since really faded. There is a strong emphasis on parallel cards with Prizm. Hits are not very prevalent here, but the occasional autograph can be found. I really wanted to like Panini Prizm when it came out because it shared many similarities to similar brands that had been popular in other sports. Hockey has traditionally had a collector base that has had less interest in parallel cards in comparison to other sports collectors, so I was hoping that this set would jump start an interest in parallels. Well... that didn't happen. Prizm left collectors feeling pretty flat about it. Though there were parallel cards available to be found, the variety to be found was just not there. The cards looked really nice, but they didn't generate any excitement as there wasn't really any difference between the cards save for the color (for the most part). Hobby and retail versions of Prizm had different sets of exclusive cards. That's usually a good idea - except when nobody really cares. I guess it has been a little while since I've opened up some Prizm. I forgot that these blasters contained a special extra little cellophane pack of colored parallels. The extra pack had blue parallels inside which tells me these cards came from Wal-Mart. If they were red they would have been Target exclusives. It's good that this extra pack was there, because without it I really would have gotten next to nothing in terms of non-base cards. This was a cool looking colored variation to get. 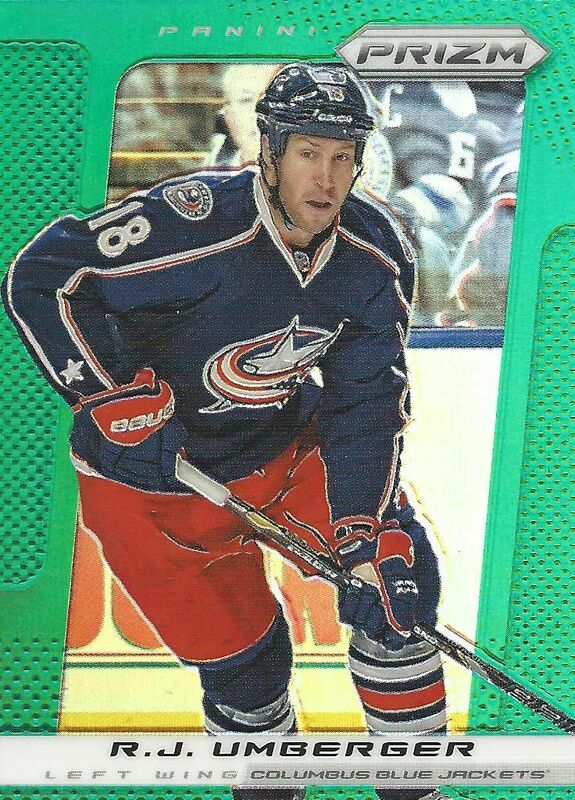 Usually in Panini terms, green is numbered to 5. That's not the case with this card, it's just a general retail parallel card that can be found in both Target and Wal-Mart pack ins. 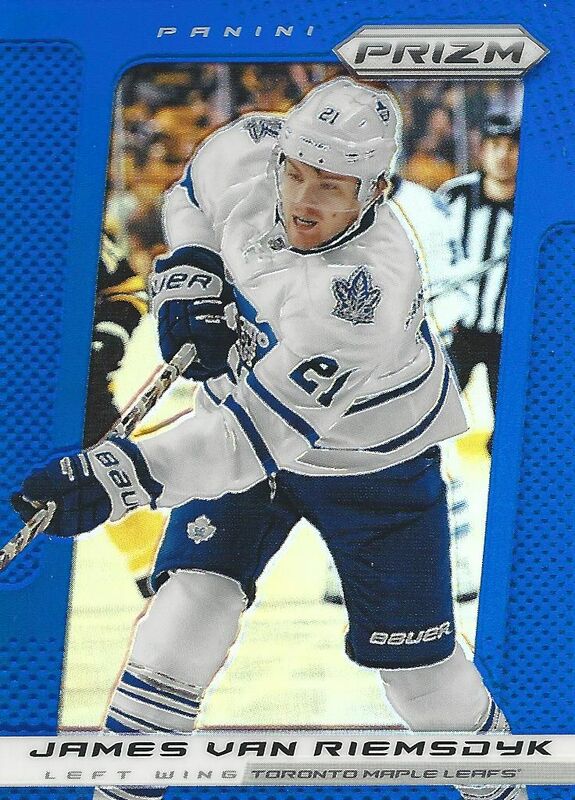 My favorite of my three-card cellophane pack was this card of JVR. Van Riemsdyk was a popular rookie when I started collecting hockey cards again so whenever I see his cards I have good memories of getting him in packs back in the day. The dual rookie class was certainly a flop for hockey collectors but there were some solid players that came from that crop of players. 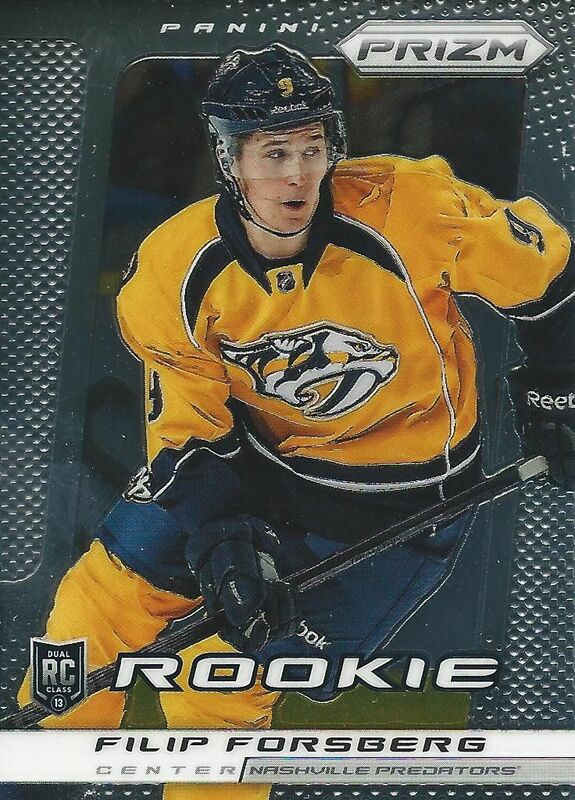 Filip Forsberg was one of the better rookies from that year and it was nice to find him in this blaster box. Prizm is a product that will provide you with a nice looking bunch of cards that are thick and of good quality. If you're looking for hits though, I'd steer clear. Autographs are few and far between and when they are found, there aren't too many to get too excited over. If you're up for a challenge, it would be fun to somehow get all the parallel cards together. I think a parallel set would be really nice all together. I don't know who'd put that together though as it would be a pretty expensive endeavor.